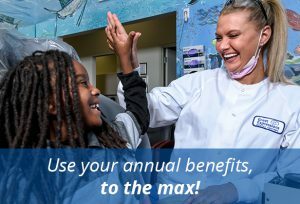 As the end of the year approaches, Great Expressions Dental Centers is encouraging families to use what’s left of their dental insurance benefits and flexible spending balance before they expire. All patients are at risk for losing coverage they’ve already paid for, as most dental coverage and flex-spending accounts reset on January 1. Great Expressions has put together five easy ways to get the most from your dental insurance and flex-spending accounts. Use these tips to finish out this year and start planning for the next! Exams + Cleanings. Make sure to take advantage of two-per-year dental exams for each family member. If you’re covered by your insurance for two annual visits, don’t skip the second visit – it’s about more than just clean teeth, it’s vital, preventive dental care. Enhanced Benefits? Find out if your insurance includes enhanced benefits. With enhanced benefits you may qualify for more coverage and services if you have Diabetes, Cardiovascular disease, or other medical conditions. Smart Savings. Get started on a treatment plan by using the remaining benefits if your account right now, and then complete the plan next year with your renewed benefits. Spreading the cost over two benefit years is a win-win: improved oral health + lower costs! Use Every Dollar. Don’t let your Flexible Spending Account (FSA) go unused. Money on your account does not roll over to next year. So, use it on a treatment plan you’ve been putting off, the whitening you’ve been wanting, or even retail products in-office. Plan Ahead! Get to your dentist and estimate your treatment plan now – then elect your upcoming FSA deductions to cover the expenses. Make the New Year the year of the smile with tooth-colored fillings, veneers, implants, crowns, dentures, braces, Invisalign, and more! To find out how much money you have left in unused benefits or your flex spending account, call your dental insurance company’s customer service number, typically located on the back of the card. For nearly 40 years, Great Expressions Dental Centers has been a leader in preventative dental care, orthodontics and specialty care with offices in Connecticut, Florida, Georgia, Massachusetts, Michigan, New Jersey, New York, Ohio and Texas. Great Expressions is consistently recognized for contributions to improving oral health through quality and safety initiatives, affordable dental care services, patient convenience, research and more. Great Expressions Dental Centers branded practices are independently-owned and operated in specific states by licensed dentists and their professional entities who employ the licensed professionals providing dental treatment and services. ADG, LLC provides administrative and business support services and licenses the Great Expressions Dental Centers brand name to independently-owned and operated dental practices. ADG does not own or operate dental practices, or employ the licensed professionals providing dental treatment and services. For more information, please visit www.greatexpressions.com.